A single up day has not made the market overbought in the short term, as one can see below. There is still room in the short term for the market to get overbought but this Friday will mark day 30 of the rally which will make us overbought in the intermediate term. If we continue to go up until then we will also be overbought in the short term. At that point I think we could expect a correction that lasts more than one session. The II survey is showing 46% bulls. 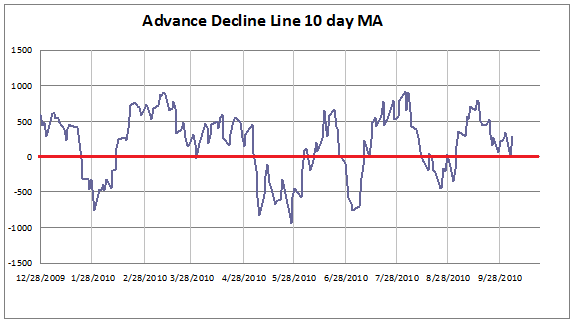 At better tops since the March 2009 lows we have seen that number above 50% and bears closer to 20%. Bears currently stand at 28%. 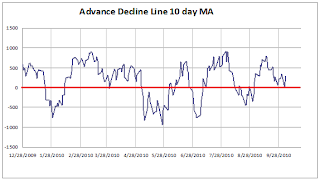 The 10 day moving averages of the put/call ratios still have room before they reach an extreme. Rydex traders are not nearly as bullish as they were at previous tops. While I have seen some studies indicating extreme sentiment, I try to stick to the indicators that I always follow in order to avoid confirmation bias. None of the indicators that I look at are showing extreme optimism in the intermediate term. That could change if the market rallies a bit more, as I sensed some giddiness yesterday. For now I think we are late in the game but with sentiment still not extreme I am not looking to take an aggressive short stance. That could change if the facts change.